Princess and I broke the law. We took a week off last month. It was during the winter break and that meant Wife, Dude and Princess were lounging around the house for three weeks, whilst yours truly were still grinding away (in a non-sexual way), working myself to death in the harshness of an air conditioned office. Albeit in a very comfortable leather chair, streaming music and a cup of coffee every now and again. Life is hard. We love music festivals so we decided to take a week and head up north to attend Innibos. A wonderful festival of music, food, art and wine. Or beer. The festival is even more fun if you are a fan of Afrikaans music. If you’re not, or you don’t understand the language, then you probably won’t enjoy the festival as much as we did. Keeping in mind there is still beer. Whilst we were up there in the Northern corner of our country we also checked out a few of the sites and skipped through the Kruger National Park. Technically, we drove through the Kruger National Park because skipping through it might imply suicide. Lions tend to go for easy prey and a family of white South Africans, skipping through the bush, might just be, what they would consider, a take-away delivery. During our little tour of Mpumalanga, which is the name of the province we were in and not an exotic dancer, Princess and I broke the law. The place is called Bourkes Luck Potholes and as I’m not a travel agent, you are more than welcome to Google it, or do a quick browse of a few photos of the place by clicking on this word. It is truly beautiful and there’s a lot of footpaths scattered across the site to take in the scenery from every possible angle. There is also quite a few signs scattered across the same footpaths, warning pedestrians not to go beyond certain points. Mainly because falling of a cliff can be detrimental to your health, even if it is a waterfall. I might seem like your typical handsome, dashing and extremely strong middle aged man but in actual fact, I’m terrified of heights. I’m not sure how I will die, but I’m 1000% convinced that it won’t be from falling off a cliff or a three story building. Or the big slide at the park. I become a paranoid banshee every time one of my family members venture to close to the edge of any higher ground. That includes arguments. Based on past experiences, the safe distance is 2.63 meters, which is even further when you measure it in foot. It is a very specific distance because anything closer than that makes my voice disappear, as my hysteric screams of panic reach supersonic levels. Back to me breaking the law. Whilst strolling along the footpath, away from the cliff, I suddenly felt an urge to do something impulsive, to break rules, to feel some adrenalin pumping through my veins, to feel alive! So I ventured off the footpath we were on and ignored the sign that was trying to save my life. I went off the beaten track. And here is the evidence of that wild moment. So ladies, if you’re looking for someone who will ignore authority, break the rules of bureaucracy or ignore the rules that keeps society from becoming animals, but in a way that won’t get him arrested or killed, I’m your man. Even though I’m taken. Hello Summer, you might be asked to leave soon as you make all the other seasons look really bad. Summer wasn’t impress, probably heard all these pick-up lines before. I needed to up my game. I know I seem desperate, but I have a confession to make. I love Summer. I absolutely L-O-V-E Summer. To death. She’s my favourite season and I might even be considered a serial stalker. Of Summer. And who can blame me? Summer is just awesome. It has these amazing clear, cobalt blue skies that stretches from horizon to horizon with shadows playing hide and seek as our yellow star laughs its way across the sky from East to West. The wonderous changing screensaver of luminous thunder clouds rolling in, soaking the earth with life-giving water and providing earthlings with a spectacular show of light and noise. Leaving behind the brisk coolness and revitalising petrichor that lingers and makes the Gringe sigh. Summer has never-ending fields of Irish green grass that stretches across mountain and valley and savannah, scattered with a million dabs of brightly coloured flowers waving their picturesque splendour at anyone with an eye. Or two. Releasing a blend of fragrances from lavender and jasmine to rose and lily. And then when those lawns are cut, the distress call of the plants releases chemicals that makes you want to lie down in it and make invisible grass angels. It’s the roaring of the turquoise, clear, expansive ocean when it chases wave after wave after wave of white horses onto unspoiled beaches, where coconut suntan lotion attack your nostrils, mixed with aromas of strawberry and apple smoothies. And vanilla ice-cream. And cigarette smoke. It’s the sounds of boisterous kids splashing in the pool. And then the sound of annoyed parents having to refill it. It’s the roar of laughter from friends that increases in volume as more empty wine bottles take up space on the table. Not to forget the mouth-watering flavour of meat grilling over an open fire at nine in the evening. Because that’s when we braai. Summer has her quiet moments too. The silence on the highways as fewer cars have to commute people to work or school. The hummed noise of parents wrapping gifts, hiding it under the Christmas tree. And the intoxicating beauty of flashing LED lights and big red and golden balls dangling from the tree, leaving most humans speechless. Summer brings excitement to my life. 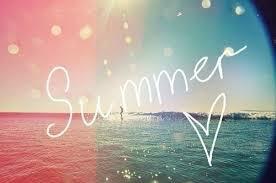 I cannot live without Summer. Summer makes me feel alive. Summer does many things to me. Summer makes me all warm and fuzzy inside. Summer stirs feelings. Feelings of anticipation for my annual vacation. Feelings of relief for a difficult year, that is now history. Feelings of celebration. Feelings of nostalgia. Feelings of joy. Feelings of excitement. Feelings of happiness. I’m infatuated with Summer and ecstatic that she agreed to stay awhile. I’ll try not be cheesy. I’ll try not be sunburnt. I’ll try not to wear a vest and flip-flops to the mall. I’ll even try to blog a little less. I promise to spend quality time with my great family. I promise to have fun. I promise to enjoy every moment of what Summer is going to be dishing out this year. 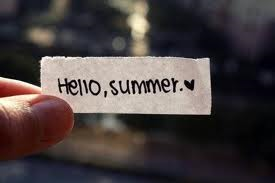 Because for all those wonderful people who’s been living under a rock made of blankets… SUMMER IS HERE!! !